There is nothing worse than being snowed in and having to go outside in the blistering cold to shovel your driveway. If that is your daily routine come winter time, you need a cheap snow blower. 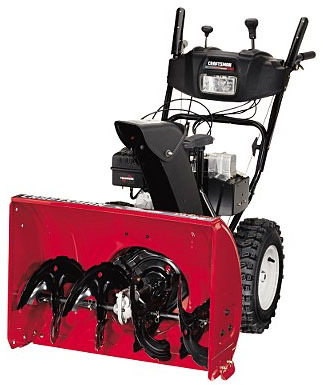 Snow blowers are a very smart investment in cold climates where there is snow for a significant portion of the year. In fact, if it snows where you live every year, chances are that many of your neighbors already own a snow blower. There are many different types of snow blowers depending on your needs. 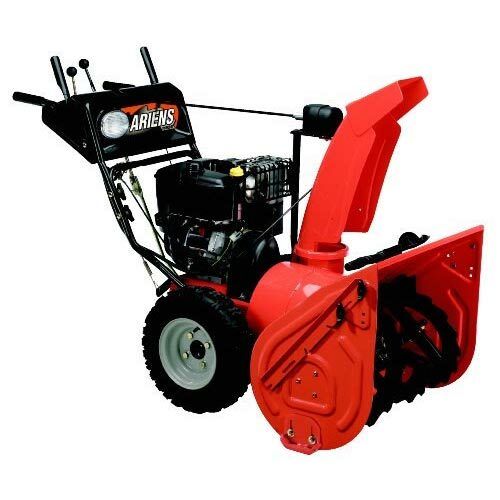 Professional-grade snow blowers like the Ariens ST36DLE and the Ariens ST32DLET can cost thousands of dollars, and they deliver professional performance for commercial use. The next step below that would be the premium quality one-stage and two-stage gas powered snow blowers made by John Deere or Honda, but they may still seem expensive to someone just looking to a snow blower to store in their garage for most of the year until they need it. If you are looking for something cheap, there are many high quality consumer-grade models. These are for meant for occasionally clearing snow away from small to medium sized areas. They are perfect for sidewalks and driveways. Some good manufacturers to look at for cheap snow blowers are MTD Yard Machines, Craftsman, and Toro. At the low end of the cost spectrum, you have "power shovels," which are the cheapest and smallest snow blowers on the market. Designed for short walk ways and small patios, they are effective only in light snow. Experts suggest that when you assess your snow blower needs, you should try to overestimate the possible snow fall. This is to make sure that your blower has the power it needs to clear the snow when it really comes down heavily, which is when you'll need it the most. Also, try to keep in mind the size and type of surfaces you will be clearing snow from, as well as how much snow you will have to clear per season. Cheap single stage snow blowers are usually eleven to twenty-four inches wide. Obviously, a wider clearing path gets the job done faster. Some quality discount snow blowers like the Troy-Bilt Squall 2100 and the Yard Machines 31A-2M1A700 blow out a 21-inch path, while the Toro 1800 Power Curve clears an 18-inch path. Small electric snow shovels like the Toro Power Shovel 38361 and the Yard Machines Snow Fox clear paths twelve inches wide. If you have larger areas to clean up and there is frequent, heavy snowfall where you live, you probably need at least a cheap gas-powered engine. Most inexpensive blowers that run on gas are more powerful than cheap electric snow blowers. 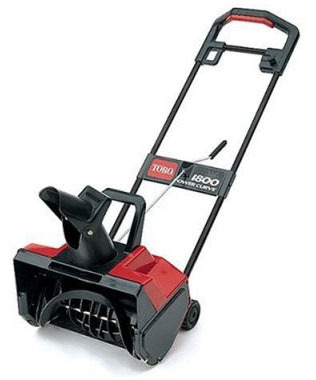 The Toro Power Clear 180 has a small 87cc motor and can be bought for around $400. Other models at the low end cost-wise are Craftsman's 21-inch path snow blower and the Yard Machines 31A-M1A700 unit, which both have 123cc engines. The Troy-Bilt Squall 2100, with its 208cc engine, has been praised by reviewers for its ability to clear out harsh Michigan winter leftovers. The brand you choose is less important than getting the right model for your particular needs. When all that's needed is a light unit that can clear sidewalks and driveways reliably, most people find that a cheap snow blower gets the job done for the right price.